Louis is available through Castaway Critters in Harrisburg, PA.
Louis is a very handsome, all black cat who’s highly adaptable. He was found as a stray but has settled easily into his foster home. When he first arrived in there,he was very aggressive toward the other cats. But since then, he’s settled in and is quite well-behaved around his feline siblings. He’s playful and is the perfect litter box user. Not the most affectionate cat of all time, but he definitely likes to be where the action is, whether it’s with the other cats or his foster mom. 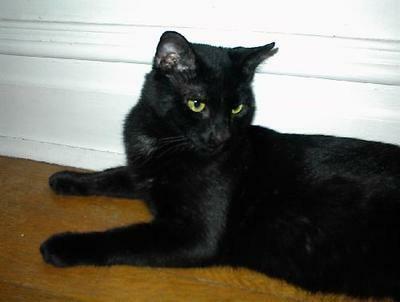 Louis is neutered, current on his vaccines, has tested negative for feline leukemia and FIV and is microchipped. Louis is available for adoption through Castaway Critters in Harrisburg, PA.